This article is about the role of priests in the Catholic Church. For information on the historical origin of the office, see Bishop. Latin Church Catholic bishop Gerhard Ludwig Müller wearing the pontifical vestments and carrying a crosier. 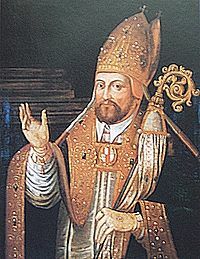 Johann Otto von Gemmingen, Prince-Bishop of Augsburg in Bavaria, 1591–1598, carrying a crosier and wearing a mitre and pluviale. In both Western and Eastern Catholic churches, any priest can celebrate the Mass or Divine Liturgy. 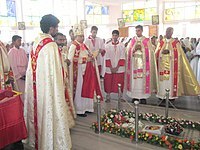 In order to offer Mass or Divine Liturgy publicly, however, a priest is required to have permission from the local Ordinary—authority for this permission may be given to pastors of parishes for a limited period, but for long-term permission recourse to the diocesan bishop is usually required. A celebret may be issued to travelling priests so that they can demonstrate to pastors and bishops outside of their own diocese that they are in good standing. However, even if a priest does not possess such a document, he may celebrate the sacraments if the local bishop or pastor judges that the visiting priest is a person of good character. The cathedral of a diocese contains a special chair, called a cathedra, sometimes referred to as a throne, set aside in the sanctuary for the exclusive use of its Ordinary; it symbolizes his spiritual and ecclesiastical authority. 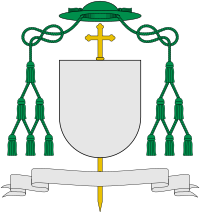 A titular bishop (or titular archbishop) is a bishop who is not bishop of a diocese; unless (since 1970) he is coadjutor or emeritus, he is assigned to a titular see, which is usually the name of a city or area that used to be the seat of a diocese, but whose episcopal see (diocese) is no longer functioning as such. Titular bishops often serve as auxiliary bishops, as officials in the Roman Curia, in the Patriarchal Curias of Eastern Churches, as papal diplomatic envoys (notably apostolic nuncios or apostolic delegates), or head certain missionary pre-diocesan jurisdictions (notably as apostolic vicar). Since 1970, a coadjutor bishop (or archbishop) uses the title of the see he is assigned to, and a bishop (or archbishop) emeritus uses the title of his last residential see. A bishop who is consecrated as such, but holds an office that as such does not require episcopal rank (so the incumbent will not be made a titular bishop), just that of Prelate, notably as Territorial prelate. When a diocesan bishop or auxiliary bishop retires, he is given the honorary title of "emeritus" of the last see he served, i.e., archbishop emeritus, bishop emeritus, or auxiliary bishop emeritus of the see. "Emeritus" is not used for a titular see. Examples: Archbishop (or Bishop) Emeritus of Place". Traditionally, bishops appointed ordinaries or auxiliaries served for life. When the rare resignation occurred, the bishop was assigned a titular see. The status of "emeritus" emerged after the Second Vatican Council when bishops were at first encouraged and then required to submit their resignations at the age of 75. On 31 October 1970, Pope Paul VI decreed that "diocesan bishops of the Latin rite who resign are no longer transferred to a titular church, but instead continue to be identified by the name of the see they have resigned." A cardinal is a member of the clergy appointed by the Pope to serve in the College of Cardinals. Members of the College aged under 80 elect a new pope, who is in practice always one of their number, on the death or resignation of the incumbent. Cardinals also serve as papal advisors and hold positions of authority within the structure of the Catholic Church. Under canon law, a man appointed a cardinal must normally be a bishop, or accept consecration as a bishop, but may seek papal permission to decline. Most cardinals are already bishops when appointed, the majority being archbishops of important archdioceses or patriarchates, others already serving as titular bishops in the Roman Curia. Recent popes have appointed a few priests, most of them renowned theologians, to the College of Cardinals, and these have been permitted to decline episcopal consecration. Examples include Karl Becker in 2012 and Ernest Simoni in 2016. The everyday dress of Eastern Catholic bishops is often the same as their Latin Church counterparts: black clerical suit with pectoral cross or panagia. When attending liturgical functions at which he does not celebrate, an Eastern Catholic bishop usually wears a mantya, panagia and an engolpion if he is a patriarch or metropolitan bishop. He will also carry a pastoral staff in the form of a walking stick topped by a pommel. Eastern Catholic bishops do not normally use an episcopal ring. ^ "Catechism of the Catholic Church – Christ's Faithful – Hierarchy, Laity, Consecrated Life". Vatican.va. 1946-02-20. Retrieved 2014-04-01. ^ "Catechism of the Catholic Church – The sacrament of Holy Orders". Vatican.va. Archived from the original on 2014-04-24. Retrieved 2014-04-01. ^ "CCC – PART 1 SECTION 2 CHAPTER 3 ARTICLE 9 PARAGRAPH 3". Vatican.va. 1975-12-14. Retrieved 2014-04-01. ^ "Catechism 1556". Retrieved 6 October 2014. ^ "Catechism 1555–1556". Retrieved 6 October 2014. ^ "Living Bishops". Catholic-Hierarchy.org. David M. Cheney. Retrieved 23 January 2015. ^ "APOSTOLIC LETTER ORDINATIO SACERDOTALIS OF JOHN PAUL II TO THE BISHOPS OF THE CATHOLIC CHURCH ON RESERVING PRIESTLY ORDINATION TO MEN ALONE". Libreria Editrice Vaticana. Retrieved 30 May 2014. ^ "Canon 390". Retrieved 6 October 2014. ^ "Code of Canon Law: Diocesan Bishops". Retrieved 6 October 2014. ^ McElwee, Joshua J. (15 February 2018). "Francis allows Vatican bishops to serve past age 75 in new 'motu proprio'". National Catholic Reporter. Retrieved 17 February 2018. ^ Pullella, Philip (15 February 2018). "Pope orders retired prelates to live austerely, shun power". Reuters. Retrieved 17 February 2018. ^ "Canon 376". 1983 Code of Canon Law. Libreria Editrice Vaticana. Retrieved 27 July 2009. ^ "Canon 369". 1983 Code of Canon Law. Libreria Editrice Vaticana. Retrieved 27 July 2009. ^ "Canon 381". 1983 Code of Canon Law. Libreria Editrice Vaticana. Retrieved 27 July 2009. ^ "Canon 386.1". Retrieved 6 October 2014. ^ "Canon 383.1,2". Retrieved 6 October 2014. ^ "Canons 388.2 and 392.2". Retrieved 6 October 2014. ^ "Canon 384". Retrieved 6 October 2014. ^ "Canon 399.1". Retrieved 6 October 2014. ^ "Catechism 1554". Retrieved 6 October 2014. ^ "Canon 883.2". Retrieved 6 October 2014. ^ "Canon 1207". Retrieved 6 October 2014. ^ "Canon 903". Retrieved 6 October 2014. ^ "Canon 966.1". Retrieved 6 October 2014. ^ "Canons 966.1 & 976". Retrieved 6 October 2014. ^ "Catechism of Catholic Church para 1623". Retrieved 6 October 2014. ^ "Canon 763". Retrieved 6 October 2014. ^ "Canon 764". Retrieved 6 October 2014. ^ "Canons 403.1, 406". Retrieved 6 October 2014. ^ "Canon 403.3". Retrieved 6 October 2014. ^ Rodimer, Frank J. (22 March 2010). "The Bishop Emeritus: Resigned but still ministering". America. Retrieved 17 October 2018. ^ Congregation for Bishops (2008). Il vescovo emerito (in Italian). Libreria Editrice Vaticana. ISBN 8820980479. ^ Confaloneri, Carlo. "Communicazione del titolo dei Vescovi 'officio renuntiantibus'" (PDF). Congregation for the Clergy (in Italian). Archived (PDF) from the original on 25 March 2017. Retrieved 17 October 2018. ^ "Lumen Gentium 18". Archived from the original on 6 September 2014. Retrieved 6 October 2014. ^ "Vatican Diary / The identity cards of the last two popes". Retrieved 6 October 2014. ^ "Canon 285.3". Retrieved 6 October 2014. ^ "Decree on Ecumenism/Unitatis Redintegratio 16". Archived from the original on 6 March 2013. Retrieved 6 October 2014.